Abbeyton Bridge continues to be monitored. Picture: Aberdeenshire Council. Council bosses have confirmed that a crumbling Mearns bridge over the East Coast main line is to be demolished at Christmas. The Abbeyton road-over-rail bridge, on the B966 just north of Fordoun, was shut in July amid fears it could collapse. Inspections found serious failings in the 170-year-old structure, which are being monitored. A specialist contractor has been brought in by Aberdeenshire Council and will work alongside council engineers to dismantle the bridge over Christmas Day and Boxing Day, starting at 10pm on Christmas Eve – after the last train of the day. Emergency measures were agreed by councillors last month to allow for the work to take place in the interests of safety. The infrastructure services committee heard an emergency closure of the line could cost the local authority around £1-3 million a day. The cost of the demolition alone is expected to be in the region of £1 million, over one third of the council’s £2.8 million annual budget for bridges and other structures. 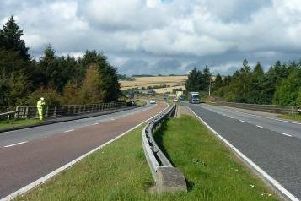 It will delay planned works on other bridges and structures around Aberdeenshire, which may deteriorate further in the interim. At this stage, no decision has been taken as to whether Abbeyton Bridge should be replaced. The council says the primary focus is on carrying out the necessary work to safeguard rail users. However, significant investment would be required to replace the bridge and it will have to be considered in the context of current budget provision. Aberdeenshire Council’s bridges manager, Donald Macpherson, said: “The only way to remove the risk posed by this bridge to the railway line below is to remove the bridge itself, as it cannot be repaired. “Given the potential financial implications an unplanned closure of the line would have, this has to take place on Christmas Day and Boxing Day, when no trains are scheduled to run. The cost of any proposed replacement bridge is likely to run into millions of pounds, and take several years to plan. The council says there is no financial provision for this within its current budgets. Closure of the bridge has impacted on road users and local businesses who say trade has been affected.